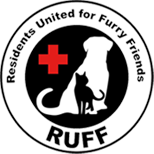 Join Residents United for Furry Friends (RUFF) in Warren, Rhode Island, in fundraising efforts to help local animals in need. Our community has compassion for all furry friends, but we need your help to make animals’ lives better. The majority of the funds donated go to the animals we’re trying to help. Your cash donations are needed to help us buy new pet food and supplies for the animals, such as leashes and collars. The money you donate is used to help pay vet bills for procedures such as spaying, neutering, and vaccination. We also help owners with emergency vet bills, animal housing, and pet food when they cannot afford it themselves. In addition to monetary contributions, our organization welcomes volunteers over the age of 18 to help with event and fundraiser support.